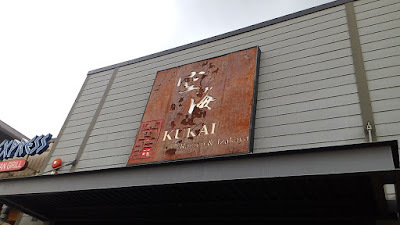 As part of their business strategy for a worldwide expansion, this Japanese ramen chain, formerly known as Kukai 空海, has officially changed its name to Kizuki Ramen & Izakaya 輝月. The restaurant sign still presented itself with its former name but the menu has been updated with the new. 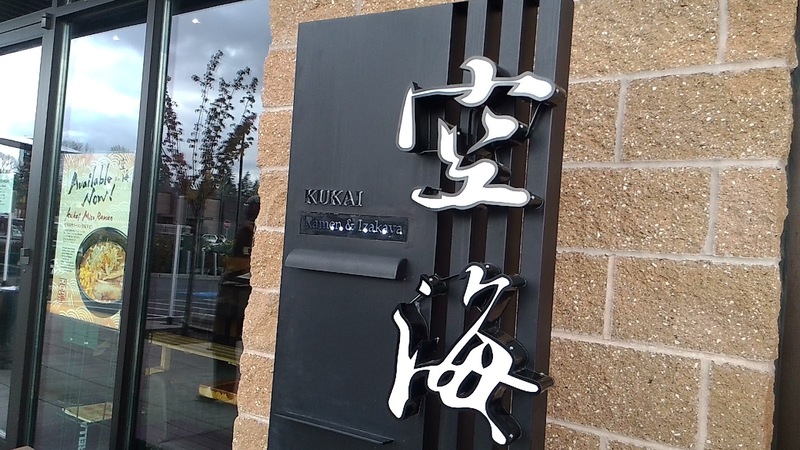 Believe it or not, this Bellevue location (opened in December 2012) was actually the first outlet opened outside of Japan. 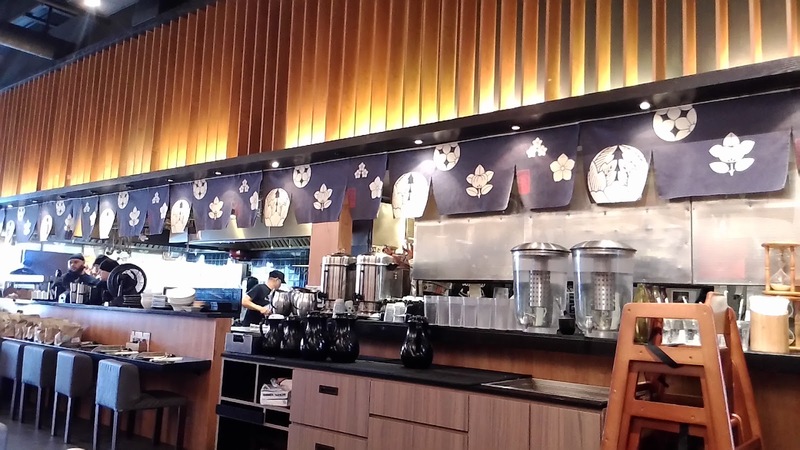 We heard about this restaurant from a Taiwanese food show (非凡大探索) after the chain opened its first Taiwan outlet in Taichung City 台中市, a food central of Taiwan. Knowing us, we have already "studied" the menu before our visit. 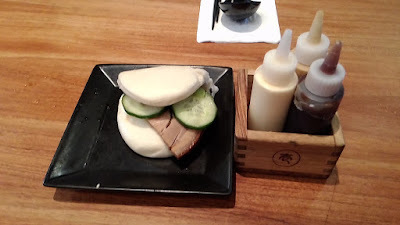 Buddha Boy has been eyeing the Japanese Pork Bun 日式豬五花掛包, which came with three mini squeeze bottles of sauces: hoisin, mayo and Japanese mustard. Honestly, the bun looked doughy, but after a bite into it...oh boy was I so wrong. 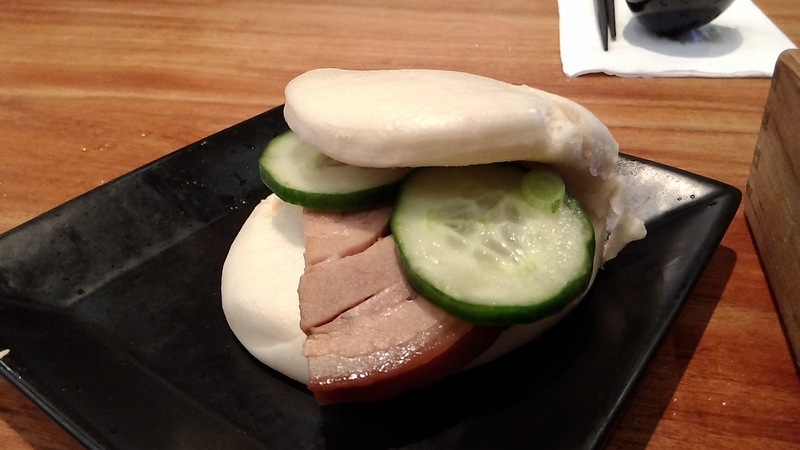 The bun was fluffy and airy, perhaps one of the better ones we've had. The pork belly had a quiet hint of soy, but flavor was quite bland so sauces were definitely needed. Cucumber and scallion added a nice mix of crunchy texture and refreshing taste. 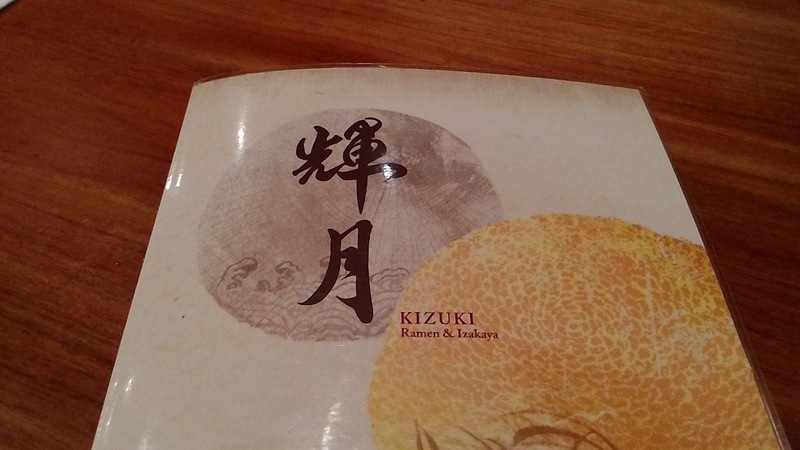 The Gyoza 日式煎餃 had that thin yet sturdy skin wraps which kept its hold through the protocols of steaming and pan-frying. 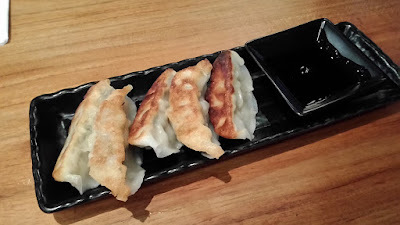 The dumplings were wrapped firmly and pan-fried to gentle crispy bottoms. The pork filling, which was mainly seasoned with soy sauce, had no excessive moisture that resulted in loose or sloppy frame. This was an enjoyable dish. When the Chicken Karaage 和風炸雞 arrived, I didn't really touch it because of its heavy coat of batter. 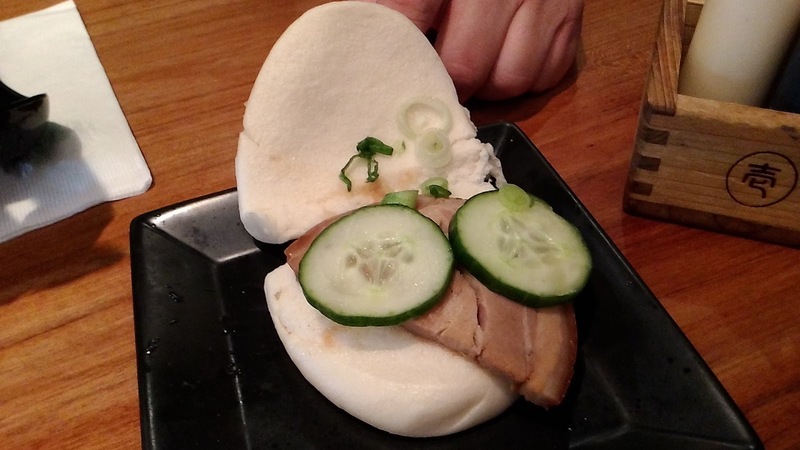 Yup, just like the steamed bun earlier, I was fooled. Each chunk of chicken was meaty, tender and moist. 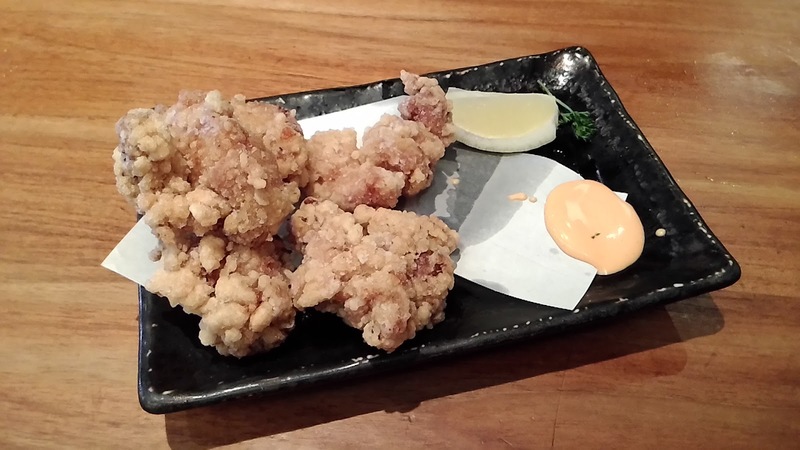 The batter, which taught me to "never judge the deep-fried by its coating", was ridiculously light and crispy. Thank goodness Buddha Boy insisted that I must try one, or else I would've miss another delicious dish. Something we would not order again would be the Spinach Goma-Ae 涼拌胡麻菠菜. 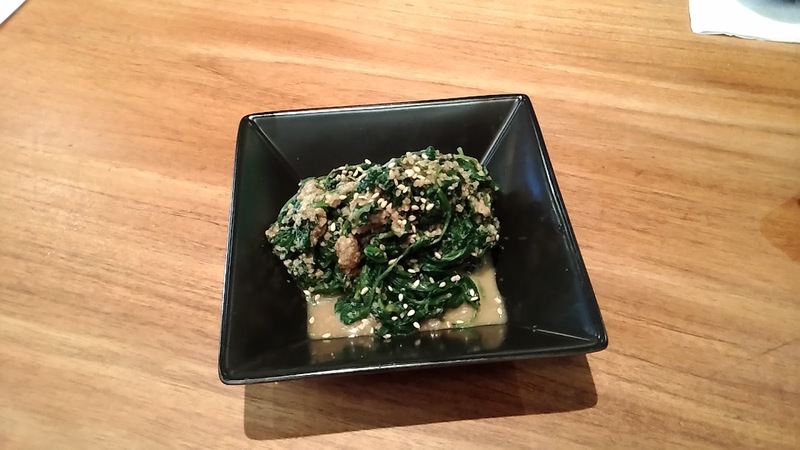 This boiled spinach appetizer is a staple for Buddha Boy in any Japanese restaurant, but the big boy was quite disappointed here. The white sesame dressing was overly salty and unreasonably sweet. While the noodles were the main carbs, I was more afraid that the goma-ae would spike up our blood sugar levels tremendously. Now to the ramen. Buddha Boy ordered a bowl of Garlic Tonkatsu Shoyu Ramen 蒜香豚骨醬油拉麵 with thin noodles. He had the choice of low-sodium or traditional and Buddha Boy opted for the latter. 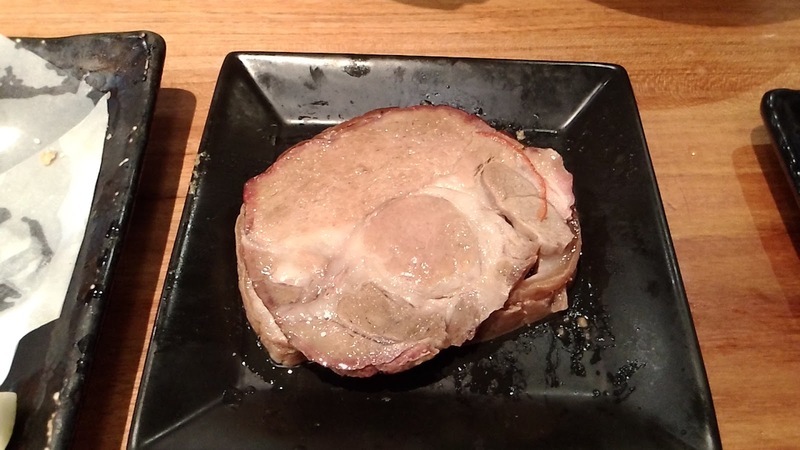 This item, according to the menu, has limited daily quantities. The broth was weak,. Even though the menu stated "lots of garlic", it really just tasted like pork broth and soy sauce with very minimal garlic. 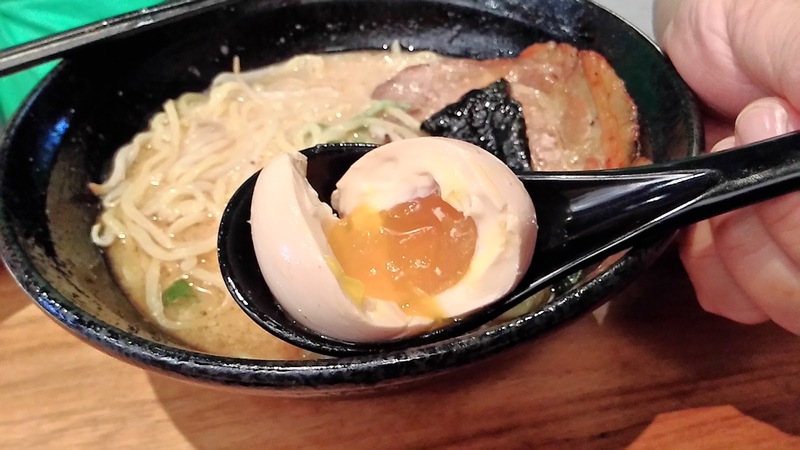 The consistency of the broth was nothing comparable to a true "traditional" thickness where one cannot even consume the broth. 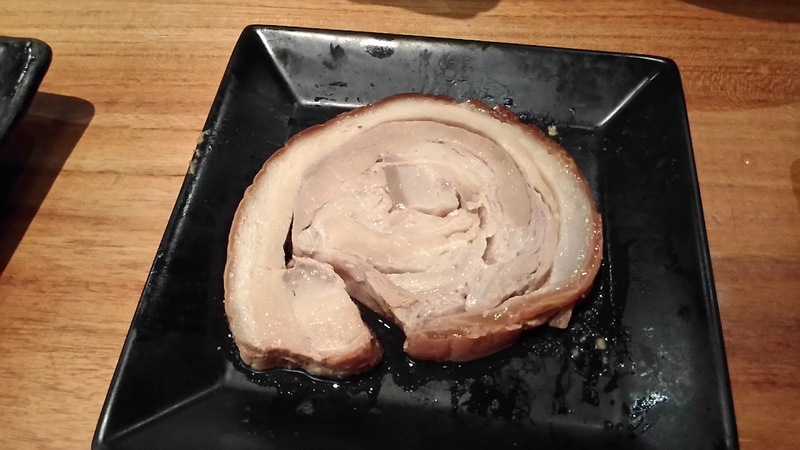 The pork chashu was lean and lacked flavor. I ordered a bowl of Yuzu Shio Ramen 柚香拉麵 with flat noodles and added a piece of pork belly chashu. This was honestly a delightful bowl of soup noodles. Unlike the rich pork broth, the chicken broth was light and flavorful. The citrus scent was a pomelo aroma, which is a common citrus ingredient in Japanese cooking. The al-dente flat noodles were firm and chewy...a heavenly Q-texture. 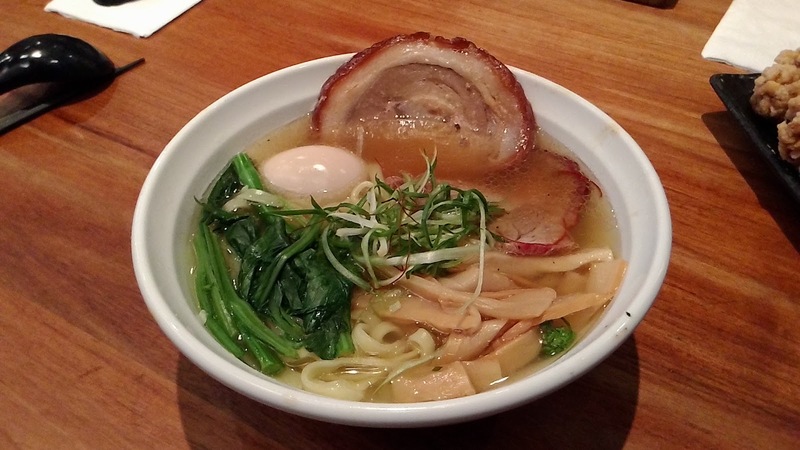 Similar to Buddha Boy's order of ramen, the meat pieces were weak and lacked flavors. The fatty pork belly chashu (left) did not have that melt-in-your-mouth structure and the regular pork chashu (right) was quite lean. Service was courteous but needed improvement. Servers were quite prompt as soon as they see you waving, but having a group constantly hanging around at the back by the cash register did create a poor image. We sat next to the cash register and it was quite awkward having a group of servers next to us chatting and giggling throughout our meal. With REALLY good noodles, mediocre broth and below average meat, would we return? Maybe. 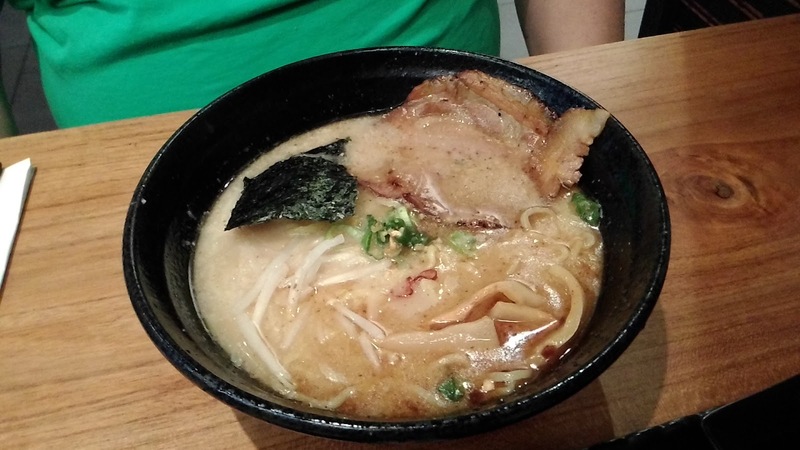 I mean, if we're in the area and I need that soup noodle fix, I would hit up this place again and order that same yuzu ramen. 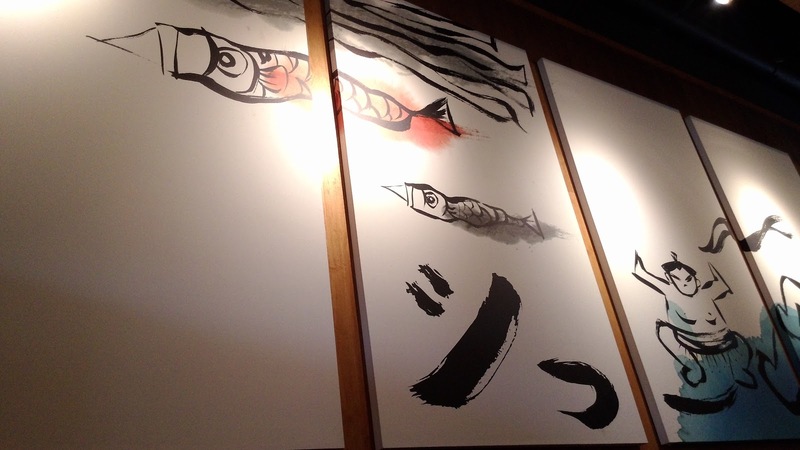 As for Buddha Boy, he would only try the rice bowls and the izakaya dishes.